The bio of Edward Pethybridge | Launceston Then! Edward Pethybridge. Courtesy of Launceston Town Couincil. Edward was born on the 8th of September 1822 to John and Elizabeth (nee Stranger) Pethybridge at East Looe, Cornwall. On the 9th of September 1851 he married Eliza Jane Dingley daughter of Richard (Agent for Tavistock Bank) and Ann Dingley at Launceston. Together they had three daughters and lived at Tamar Terrace, Tavistock road, Launceston but sadly Eliza passed away in April of 1859. Edward remarried in 1862 to Emma Dingley of Sherborne, daughter of William and Grace (nee Pearse)Dingley. 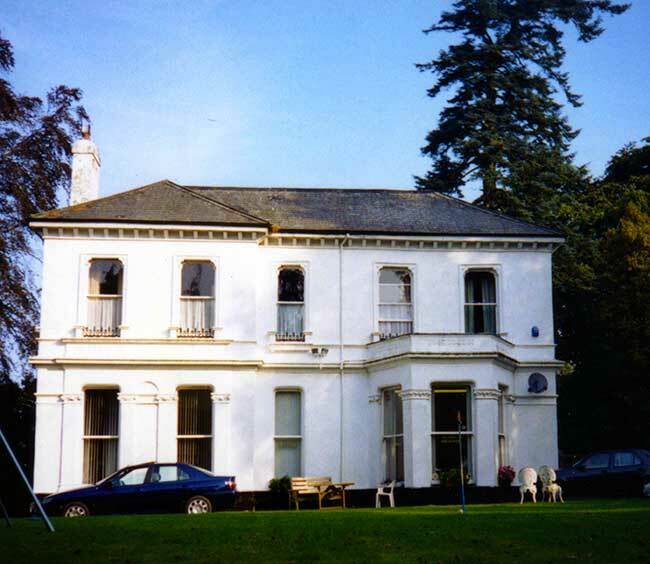 With Emma, Edward had four sons Edward Dingley, John Ley, William Ernest, and Frank and by then the family had moved to the larger premises of Manaton house, Dunheved road, Launceston (below), named after the birthplace of his father John, in Devon. 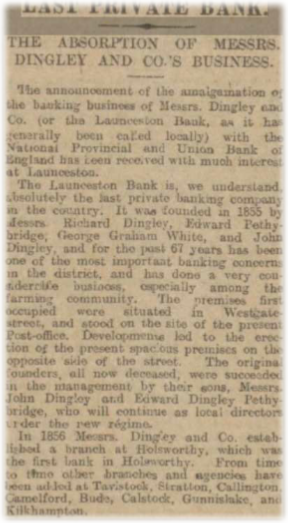 Along with his father in law Richard Dingley, George White and John Dingley he co-founded the bank of Messrs. Dingley, Pethybridge, White and Dingley in 1856 at Okehampton. They held branches throughout the north and east Cornwall and west Devon. Edward grew up in a Wesleyan family and was to prove to be himself a prominent supporter by holding every office that a layman could hold within the church. He eventually became the eldest preacher on the circuit. As goes for many Wesleyans, Edward was a strong Liberal and was the chairman of the local branch.. Like many of his generation he possessed a philanthropic soul and supported many institutions with the aim in helping the poor. 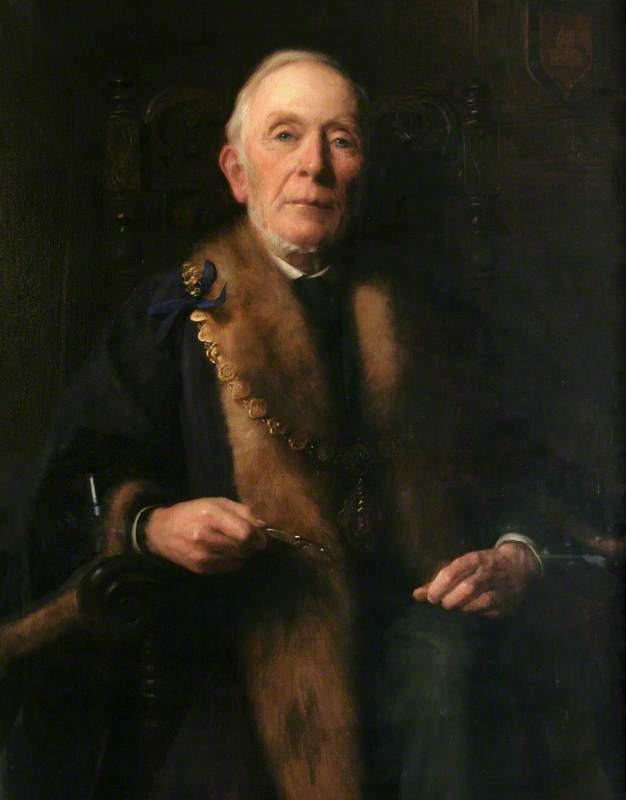 In 1864 he was elected a member of the Launceston Town Council and for the next 53 years he continued to serve the town council being twice elected the Mayor, 1866-7 and 1881-2. Along with Richard Peter and Richard Robbins, he helped break down the monopoly that had existed on Launceston’s town council in the 1860’s, which in turn helped usher in a period of rejuvenation for Launceston’s prospects and major improvements in its infrastructure. In 1888 he was made an Alderman a position he held up to his death. He was also a county magistrate and for some time an Alderman on the Cornwall County Council. 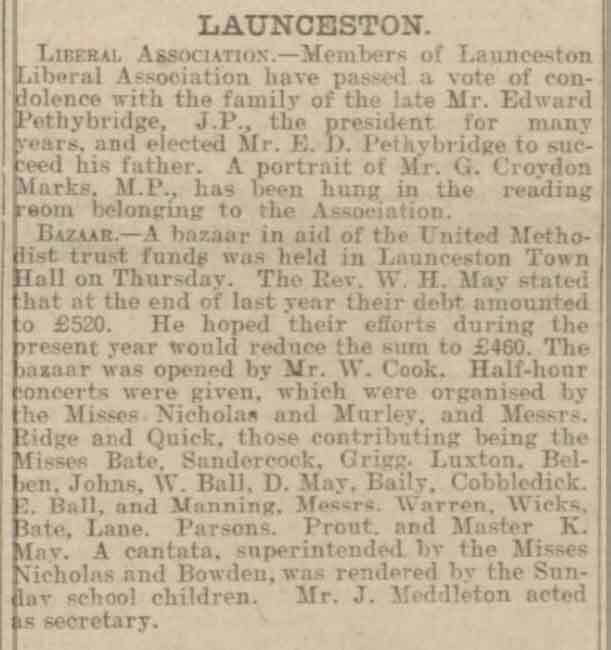 It is with education that he really did have a keen interest being the chairman of the Launceston school board up to its demise under the education Act of 1893 and was a major mover in the establishment of Dunheved College, Dunheved road in 1873. 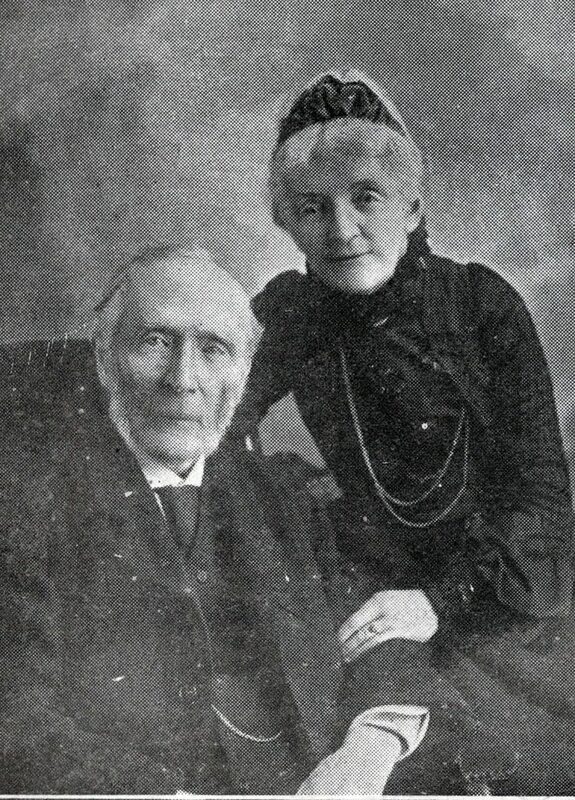 Edward Pethybridge and his wife, Emma. In his latter years he suffered from sciatic pain and with the loss of both his son, Ley and his wife Emma in 1905 telling on him, his health began to deteriorate. Edward passed away on the 6th of October 1907 at his home, Manaton, Dunheved road. In his will he left a total of £24,347 6d. 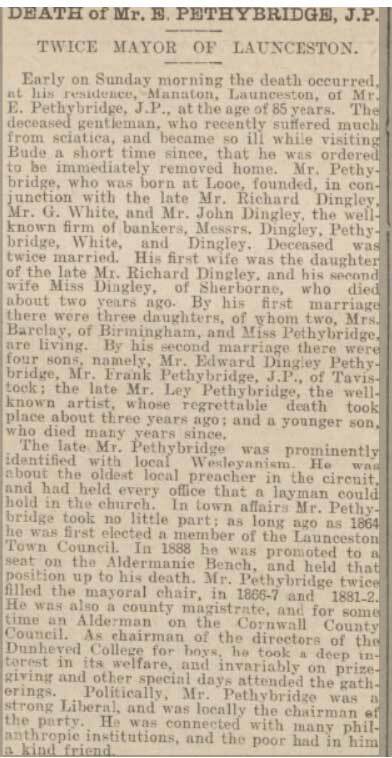 to his sons Edward Dingley Pethybridge and Frank Pethybridge both Bankers.